Like a master painter who uses the same brush techniques to continually create original works of art, evolution has produced unique species to fill new or vacated ecological functions by tinkering with just a few basic body plans that have changed little in hundreds of millions of years. The end result: tremendous diversity in myriad combinations of animal life. But a comprehensive analysis of marine fossils by Stanford researchers shows that the evolution of ecological diversity—what animals do—did not, as some scientists predicted, follow the same pattern as the evolution of taxonomic diversity-what animals look like. Instead, it developed at a much slower pace, culminating with the rich assortment of animal functions that exists today. "The fossil record provides clear evidence that the basic body plans that all marine animals follow today evolved around the time of the Cambrian explosion 542 million years ago and almost all subsequent new species are variations on those themes," said Stanford paleobiologist Jonathan Payne, who is a coauthor on a new study detailing the findings. "But what animals have been able to do with those body plans has changed dramatically, and took much longer to reach the point that we see today." In the study, published online on March 4 in the journal Nature Communications, Payne and his team test a theory proposed by famed evolutionary biologist Stephen J. Gould and others that the evolution of ecological function underwent an "early burst" during the dawn of animal life, similar to that of body plans. Payne's research team did this by categorizing two-thirds of the entire marine animal fossil record according to specific criteria related to ecological function. The scientists took each group, or genus, of marine animals and assigned it an 'ecological mode of life'-a Rubik's Cube of possibilities that factors in a creature's habitat, how mobile it is, and its feeding mode. For example, a sea sponge that lives attached to the seafloor and feeds on organic particles wafting by on ocean currents has a different ecological mode of life than a tuna, which swims through the ocean and preys on other fish. The team did this for more than 18,000 genera and revealed how the functional diversity of marine animals has evolved through time—something that had never been done before. The result was surprising. "Our evidence is very clear that, unlike basic body plans, the ecological functions of animals did not appear in an early burst at all. Rather, it's quite the opposite," said Matthew Knope, a former postdoctoral researcher in Payne's lab and the lead author of the new study. "What we show is that marine animals have followed a 'late filling' model in which it has taken the past 542 million years to get to where we are now-a world filled with a dizzying array of animals doing vastly different things from one another. The world that we see today has really been created over the very long expanse of evolutionary time." Another key insight from the research is that in the aftermath of the two largest mass extinction events in Earth's history-the End Permian extinction 252 million years ago and the end Cretaceous 66 million years ago-the number of ecological functions not only bounced back, it rebounded well beyond pre-extinction levels so that more ecological roles were filled than ever before. 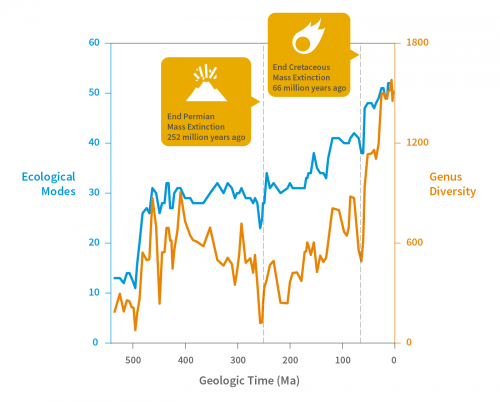 "It appears that after those mass extinctions there was a loss of previously dominant groups. This created ecological opportunities for the surviving groups," Payne said. Payne's group has been interested in the question of whether biology follows certain trends. A previous study by the team found fresh support for Cope's rule, a theory in biology that states that animal lineages tend to evolve toward larger sizes over time. The team has now found evidence of another trend in the history of life on Earth: the increase of ecological diversity over time. "What's striking is that unlike body size, which exhibited gradual, long-term trends, there were big jumps in ecological diversity after mass extinction events," Payne said. While the findings offer hope that Earth can recover from the current extreme loss of biodiversity caused by human activity-sometimes called the "Sixth Mass Extinction"-the scientists say there is one important caveat to keep in mind: in both of Earth's two largest mass extinction events, the recovery took about 20 million years. "Life may rally back from the current mass extinction," Payne said, "but that recovery will never be seen by humans." More information: "Comparative history of taxonomic and functional diversity in marine animals," Nature Communications, 2015. 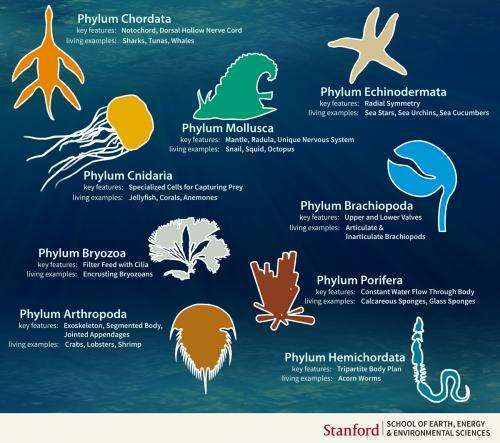 They forgot the Ctenophores, the earliest branching Metazoa. "This atoms to ecosystems model of ecological adaptations links nutrient-dependent epigenetic effects on base pairs and amino acid substitutions to pheromone-controlled changes in the microRNA / messenger RNA balance and chromosomal rearrangements. The nutrient-dependent pheromone-controlled changes are required for the thermodynamic regulation of intracellular signaling, which enables biophysically constrained nutrient-dependent protein folding; experience-dependent receptor-mediated behaviors, and organism-level thermoregulation in ever-changing ecological niches and social niches. Nutrient-dependent pheromone-controlled ecological, social, neurogenic and socio-cognitive niche construction are manifested in increasing organismal complexity..."
http://dx.doi.org...b4001867 MicroRNA-Based Single-Gene Circuits Buffer Protein Synthesis Rates against Perturbations "... precise control of protein synthesis can be realized using a single-gene microRNA (miRNA)-based feed-forward loop (sgFFL). This minimal autoregulatory gene circuit consists of an intronic miRNA that targets its own transcript. In response to a step-like increase in transcription rate, the network generated a transient protein expression pulse before returning to a lower steady state level, thus exhibiting adaptation. Critically, the steady state protein levels were independent of the size of the stimulus, demonstrating that this simple network architecture effectively buffered protein production against changes in transcription."